​Classic Luhrs Cabo fishing machine, recently updated with a 3208 turbo diesel- this boat gets you to the fishing grounds fast! This boat has a local reputation for raising fish! 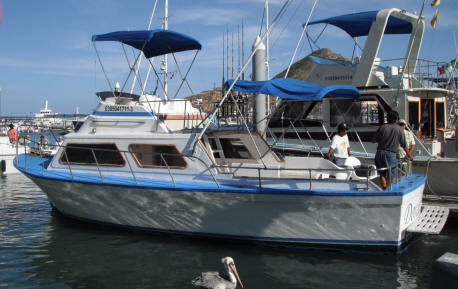 The deck & flybridge have been remodeled allowing an extremely spacious and comfortable deck to fish & relax on. Equipped with Penn Intl. & Senator Gear, outriggers,large flybridge, live bait tank, 2- fighting chairs, shade & restroom, VHF radio, plus tournament winning Captain & Mate. Includes: Experienced Captain & Mate, Penn International and Senator reels, wide selection of lures including trolling lures for Marlin, Dorado & Tuna plus smaller lures for Sierra, Skipjack, Tuna, Roosterfish and more. dispatch fees & dockside bilingual departure/arrival assistance. Why not add the extras below - food, drinks, bait, & license & dock fees, so you don't have to worry about anything but just getting on the boat! Above Charter with "Just get on the Boat", All-Inclusive option: 4- anglers $190/day extra- includes in addition to regular charter: 10-live bait, lunch, license, & 20 drinks(all beer or mix of soda/water/beer & dock fees , 6- anglers all- inclusive option $260/day extra - includes in addition to regular charter: 10-live bait, lunch, license, & 24 drinks(all beer or mix of soda/water/beer & dock fees. 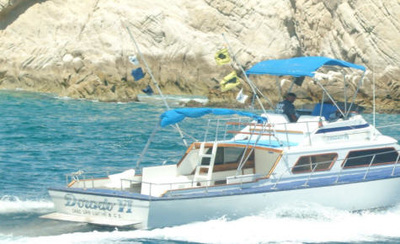 I fished with you in Cabo in December and just wanted to compliment you on a well run boat with a really great crew. My son caught his first Billfish a 130 pound Striped Marlin and my daughter got a nice Dorado. Thanks for some great memories, we are all looking forward to our next trip to Cabo!